Gregory Bernard is an associate lawyer at George Murray Shipley Bell, LLP. Gregory’s legal practice focuses on, Corporate and Commercial, Wills and Estates and Real Estate, wherein he especially takes pleasure in the excitement and privilege that comes along with helping First-Time Home Buyers’ acquire their first home. Gregory was born and raised in Sarnia, where he attended Sacred Heart Elementary School and St. Patrick’s High School. 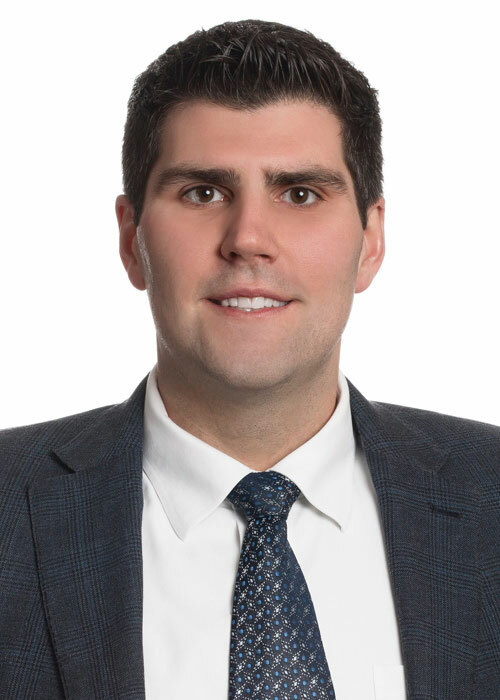 After high school, Gregory received an Honours Degree in Political Science from the University of Waterloo in 2007, and entered law school in 2008 to earn his Juris Doctor degree from Osgoode Hall Law School, graduating in 2011. After articling in the Sarnia area with a local law firm, Gregory was called to the Ontario Bar in 2012. Gregory has always maintained close ties with the Sarnia-Lambton area and was very happy to return home following the completion of his schooling to serve the community that helped to raise him. Outside of the office, Gregory’s interests include hockey, tennis, golf, jogging, cinema, reading, fishing, travel and relaxing anywhere along Sarnia’s beautiful waterfront.